Never a dull moment at the Bryan household. Luke Bryan has his hands full with trying to balance a successful country music career while caring for his two sons Bo and Tate, his college sweetheart wife Caroline Boyer…and all the animals that live on his Tennessee farm. The Bryan family lives on plenty of land near Nashville and no country family is complete without its share of furry friends to care for. They all live at Brett’s Barn, an animal rescue which was started in honor of the Bryan’s late infant niece Sadie Brett Boyer, who died when she was just a baby from health complications. The Brett Boyer foundation was also set up in her name to raise awareness for congenital heart disease and Down syndrome. And even though Luke Bryan and his family have suffered some awful tragedies, they still have room in their hearts to care for animals who need their help. You can bet there are chickens on their farm. 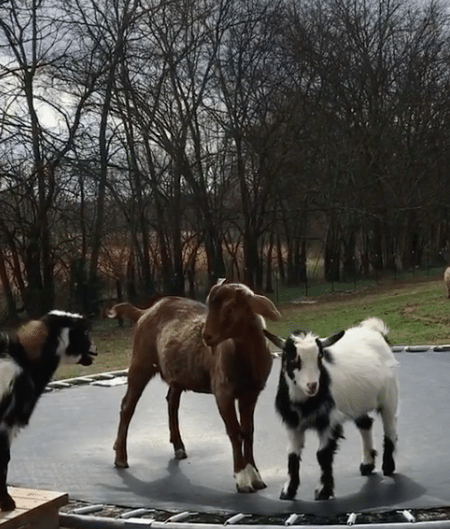 And goats that love jumping on the trampoline. Of course the family has a loving Labrador Retriever. My sweet Choc! ♥️ Still can’t believe he sat still for this!!! But there are also llamas, Pekka and Mister. And there’s always room for donkeys! Margo and Todd are two baby kangaroos that the Bryans welcomed to Brett’s Barn Christmas morning. And a few miniature horses live there too, including Kilo, since Brett would have wanted a white pony. Brett’s Barn is really a special place. And the rescue animals that go to live there get a second lease on life and a new home, like Goober Goldsby. There have been so many country music stars who have helped to make this world a better place for animals. Miranda Lambert has her well-known MuttNation Foundation which helped save 70 dogs from Hurricane Harvey. Then there’s Brett Eldredge who loves his dog more than life itself. Christina Taylor rescued two dogs from Alabama, and Michael Ray has some rescue pets and a foundation of his own. Country music is defined by its geography and lifestyle, and that includes animals too, as Luke Bryan and his family remind us.